You don’t have to put a lot of work when hosting a brunch party. It should be smooth and stress-free. But without some help, you may be overwhelmed. Of course, there is no better way to start this party than having your loved ones around, but the food you prepare matters. Many people are hesitant to host parties because of the stress of waking up early to cook for the guests. 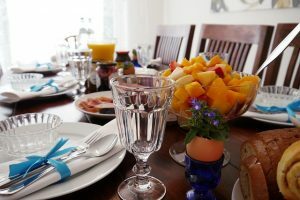 But whether it is a breakfast party or a small birthday party, you can use these food ideas for brunch party and have a great time. Pancakes are a popular breakfast dish, and with the almond taste added to them, nothing could be better. Get all the ingredients of the regular pancake, but remember to use the almond flour. Once the pancakes are ready to be served, you can decorate it with strawberries or raspberries and serve with a cup of yogurt. This is a great choice if you are considering doing a Christmas brunch. You don’t really have to go the extra mile of cooking. Sometimes all you need is something as simple as a salad. And what could be better than a grape salad with a taste of mint? You can serve this fruit salad with sweet milk. And remember it won’t stay frozen for long, so it is not recommended you serve too early. You will need grapes, of course, Meyer lemon, freshly chopped mint and dates. Cut them into nice presentable pieces and serve with milk. Sausages are an excellent way to kick-start your day. You will need a puff pastry preferably thawed, 2 tablespoons of marble syrup and sausages plus 1 egg for coating. Start by preheating your oven up to 425 degrees and remember to put a rack on the center. Roll out your puff pastry to 12-inch square and brush some marble syrup at the center. Next you cut the dough into thirds and form triangles. Then whisk egg with 1 tablespoon water. Then finally brush each puff with egg wash and bake for close to 15 minutes until golden brown. This is an excellent option during the colder months. To prepare this, you need rolled oats, coconut flakes, chopped pecans, coconut oil, vanilla extract (optional), finely chopped blueberries, salt, mashed bananas, and golden flax meal. Start by preheating your oven to 350 degrees. Combine all the ingredients until they are well mixed. Press about 21/2 of the mixture into a round cookie. Do that for all the cookies then place them in the oven. After about 25 minutes, your cookies will be ready served with milk or juice. With these food ideas for brunch party, you will be able to efficiently host your guests. Remember to take time to plan for the menu as early as a week ahead. This way you will have enough time to buy everything you need. A well-thought menu makes the serving of your dishes and drinks seamlessly. Also, do not forget to include drinks. Many people tend to ignore but with your foods need to be accompanied with some drinks.